Have you VARKED your Business? 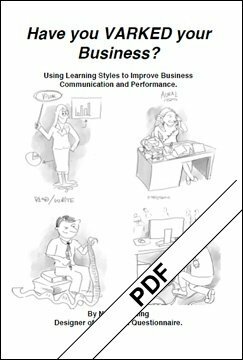 : Using Learning Styles to Improve Communication and Performance. This book, first published in October 2011, outlines the ways in which you can use VARK in your workplace. There are numerous practical examples and applications that will give you a full understanding of VARK principles. Some Chapter headings: Age and communication preferences, Communicating with your staff, What do advertisers and marketers know about learners?, When marketers want to understand customers?, Allocating tasks to staff and teams, Meeting behaviors, Learning about retail customers, Appointing the right person, Do some employees learn only from doing?, Making your case for promotion, What training works best?